Looking for 30 minute meals that just scream comfort food? I have you covered! 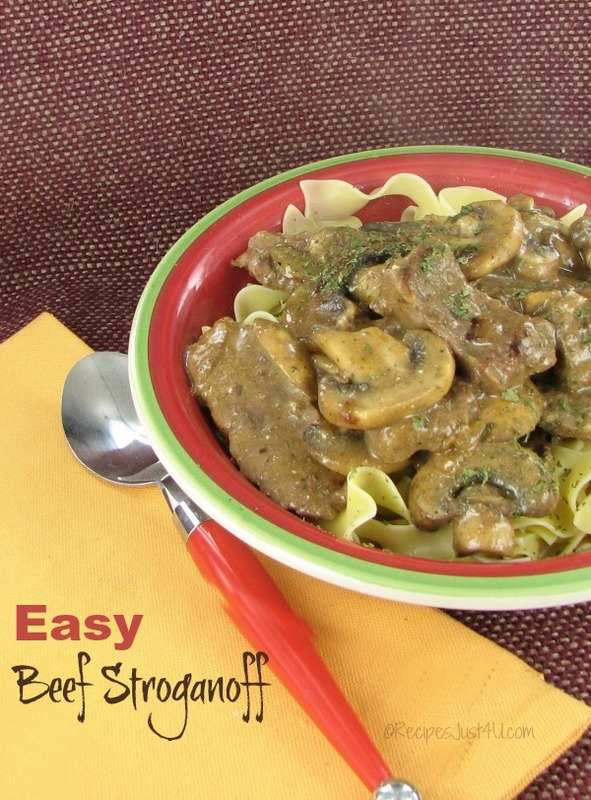 This 30 minute easy beef stroganoff recipe is a real favorite with my family. It is rich and hearty and perfect for a night when the days begin to get shorter and are much cooler. I love it because it only takes 30 minutes from start to finish, and tastes like you spent hours preparing it. Home cooking at it’s best! Just combine beef and noodles and you will have a happy family. There is something so comforting about a beef and pasta dish. It always reminds me of my mom’s kitchen when I make one. 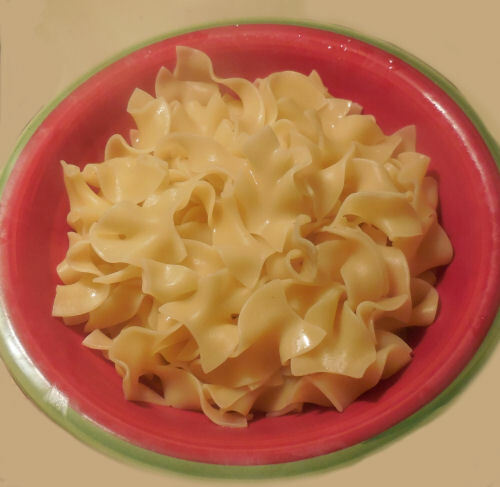 See my gourmet beef noodle casserole for another tasty idea. 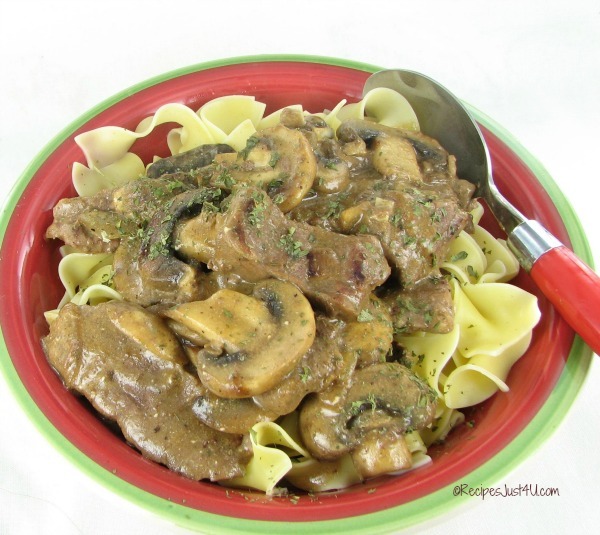 Easy Beef Stroganoff is ready in a flash! Start by cutting your sirloin into strips and browning it on both sides in a bit of butter. 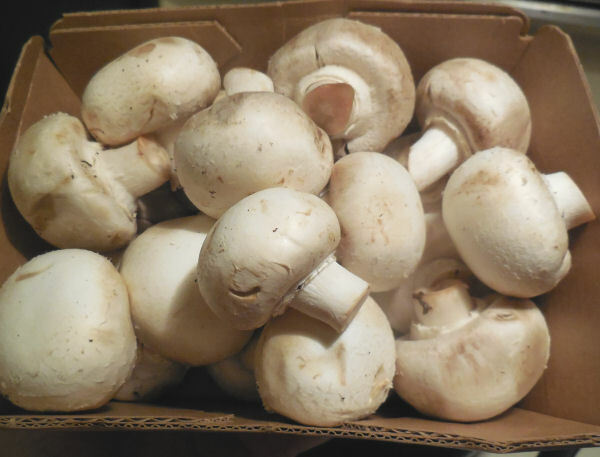 You can use any mushrooms you like, but this time, I chose large white mushrooms. They are big and plump and hold up well when you slice them. 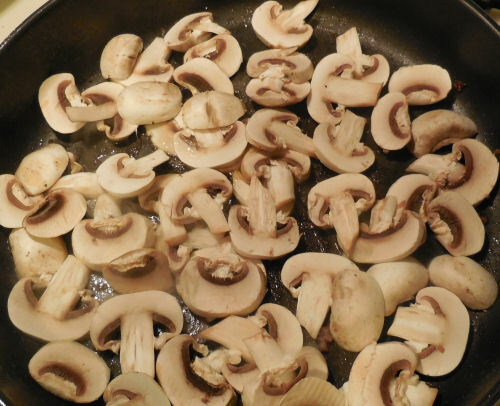 When your beef is browned, remove it and keep it warm and add the sliced mushrooms to the same pan. Don’t crowd them and let them cook for a few minutes before you turn them to get them caramelized well. This is important, if you stir them too much, they will get soggy. Now add the beef and mushrooms back to the sauce and stir to reheat and incorporate well. Stir in the dry sherry and spices now too. The Sour cream is the final step. Mix well, but don’t boil, or it may curdle. For my pasta, I used No Yolk noodles. They are ready in about 10 minutes and make the perfect base for the easy beef strogonoff recipe. Garnish with a bit of parsley and serve. The beef turns out very tender and the sauce is so rich and creamy. Your family will love it as much as mine does, and ask for it again and again. Can you see why? Hard to believe that this can be on the table in 30 minutes. This easy beef stroganoff is perfect for a busy week night and fancy enough to serve for company. Why not try it this week? If you don’t have sirloin on hand, this dish can also be made with ground beef. 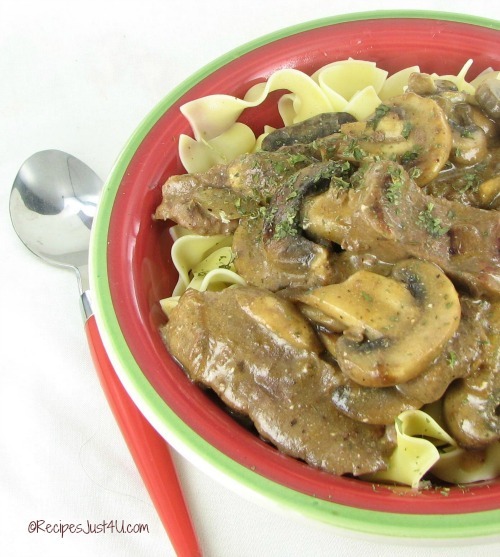 See my ground beef stroganoff recipe here. Cook the noodles in boiling salted water, according to package directions. Drain and keep warm. Heat a large nonstick skillet over medium-high heat and add 1 1/2 tbsp of the butter and let it melt. 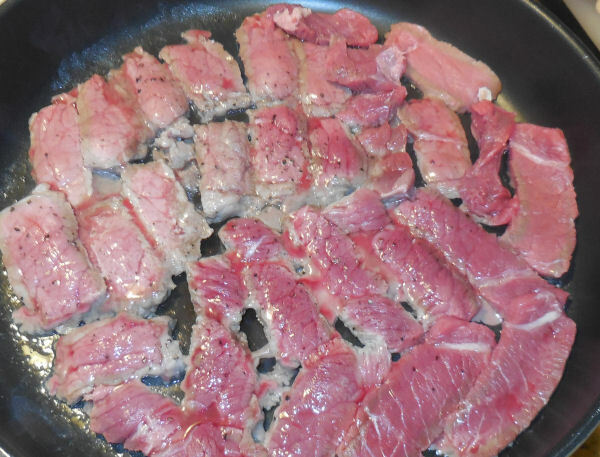 Add the sirloin beef strips to the pan; cook until well browned - do not stir much during this part of the cooking. Let it brown well on one side and flip over. Remove beef from pan, place in a large bowl, and keep warm. Melt the remaining 1 1/2 tbsp butter and add the mushrooms, garlic and onion to the same pan; sauté 4 minutes. 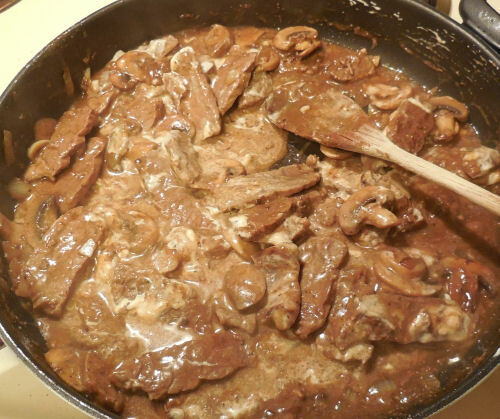 Combine the mushroom mixture with the reserved beef strips. Melt 1 tbsp butter in a pan over medium heat. Add the flour and cook 1 minute, stirring with a whisk. 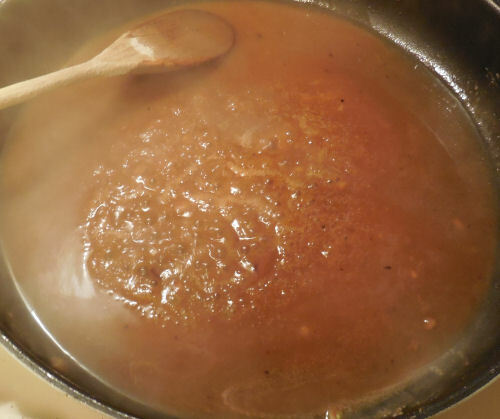 Gradually add the beef broth, stirring the whole time. Cook for about 1 minute or until the mixture is thickened and bubbly, being sure to stir often. 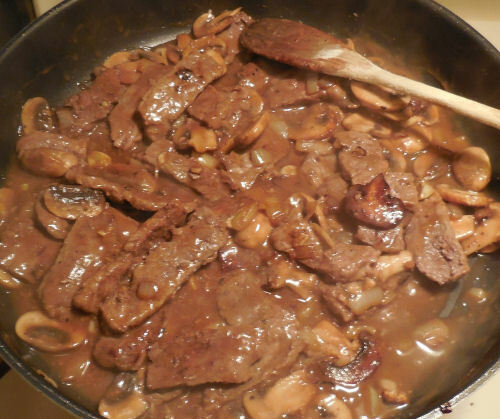 Return the mushroom and beef mixture to the pan. Add the dry sherry, nutmeg, paprika, salt, and pepper; bring the mixture to a boil. Reduce the heat, and simmer about 4 minutes. Remove from heat. Cool slightly and stir in the sour cream. Combine noodles with the minced parsley. Serve the mushroom and beef mixture over noodles. Garnish with parsley sprigs, if desired.